I love how this hole ripped jacket looks so well match with my pastel U skirt, and I add a fake layered tops to give some sweet details on my look. 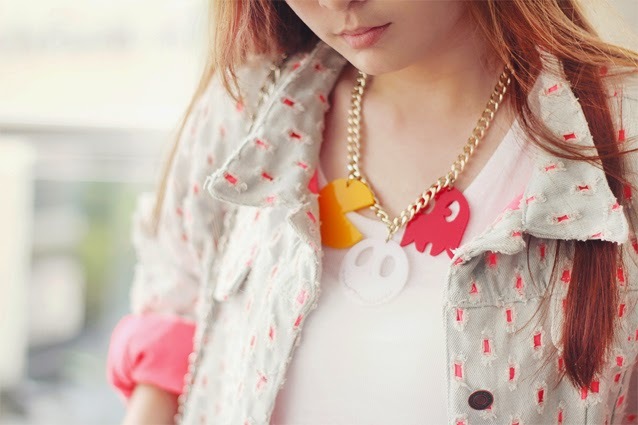 Last but not least, I drool over this pacman necklace so much! Psstt.. they're in stock at my online store now, you can have yours too by visit instagram @maythe6 and choose yours, they are avail in many cute shapes but the Pacman is my favorite! I love those white platforms! cool jacket.. love your platform..